Have you ever considered adopting a dog? Many of us contemplate the idea but never actually take the plunge, worried about the responsibility, about who’ll look after him go if we go on holiday or go out all day, about ending up with a “bad dog”, about vet and food bills, about making time for enough exercise and training, about getting up early in the mornings or during the night to take him out, or a whole host of other things, both real and imagined. With a new dog in your home, you’ll be spending time walking, playing with him and stroking him, and with this often comes a lowering of general stress levels. This can be both a subjective improvement and a clinical one, as blood pressure has been seen to lower in dog owners. Recent research has shown that petting a dog for fifteen minutes releases the feel-good hormones serotonin, oxytocin, and prolactin whilst lowering the stress hormone cortisol. Blood pressure has been shown to drop by up to an astonishing ten percent! 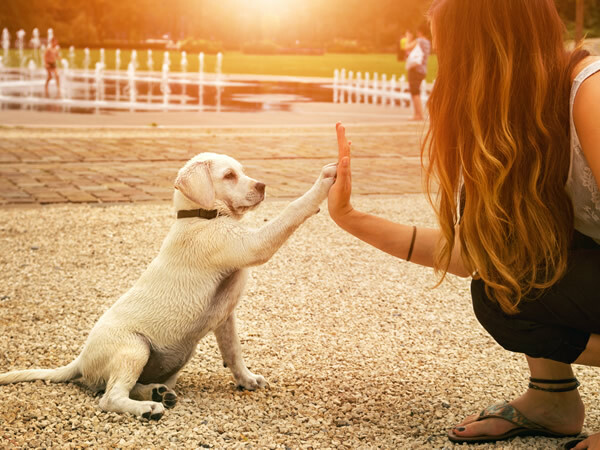 It may sound strange but getting a dog can improve your social life. Wherever you go walking, people are likely to stop to pet your dog and talk to you about his history. Other dog owners always want to share funny stories, woes, and advice about dog care and training. Friends, those who own dogs and those who don’t, will often be clamoring to come over and meet your new guy or girl and you will all have something lovely to talk about…. dogs! Even if you make exercise a priority in your day-to-day life, in the winter months it’s always more of a challenge. You may have the intention to spend more time outdoors exercising but it’s too easy to look out at the rain and retreat to the sofa with a cup of tea and a tin of biscuits. With a dog in your life, you’ll get two good walks every single day, depending on the requirements of your new best friend of course. You’ll need to go out morning and evening, rain or shine, and often go out to play in the garden together regularly too. Dog walking is a wonderful, joyful and easy way to take lots of exercise without even realizing it. You’ll be outside much more once you’ve got a dog, both walking and just generally hanging out in the garden, even in bad weather. A lot of recent research is showing that we should all be spending more time outside in the natural daylight, especially in the winter months when the days are short. Natural daylight, especially first thing in the morning, triggers the production of serotonin which is associated with good mood, calm and focus. It helps to regulate sleep, easing insomnia and promoting restorative sleep. If you wear a fitness wrist band or monitor your heart rate in any way, you may notice that it is lower at rest after having a dog for a few weeks. Whether this is from the extra exercise or the general feeling of lower stress is debatable. Research has shown that a lower resting heart rate is yet another benefit of dog ownership and that, in consequence, dog owners are more likely to survive a heart attack compared to non-dog owners. Many people suffer from a low mood in the winter. If you own a dog, you may well notice yourself feeling much happier and less depressed. This may be a consequence of exercise and daylight or the hormone rush of loving and being loved by a new furry friend. Whatever the cause, you could well enjoy the sense of well-being that becoming a dog owner gives you each and every day. Nothing makes us feel safer than knowing we will be woken up if there’s a problem and that we’ll have fore-warning of an intruder. A dog in the house ensures that there will almost certainly be a volley of barking if anyone approaches or attempts to enter your home. Adopting a dog is not a decision to be taken lightly, of course. The responsibility is huge, you need patience, a lifestyle that allows you to be home a lot of the time, you need to make a long term commitment of care and love for an animal that could be with you many years and may encounter expensive food and vet bills along the way. But if you are able and willing, the benefits really can be huge, for both the dog and for you.